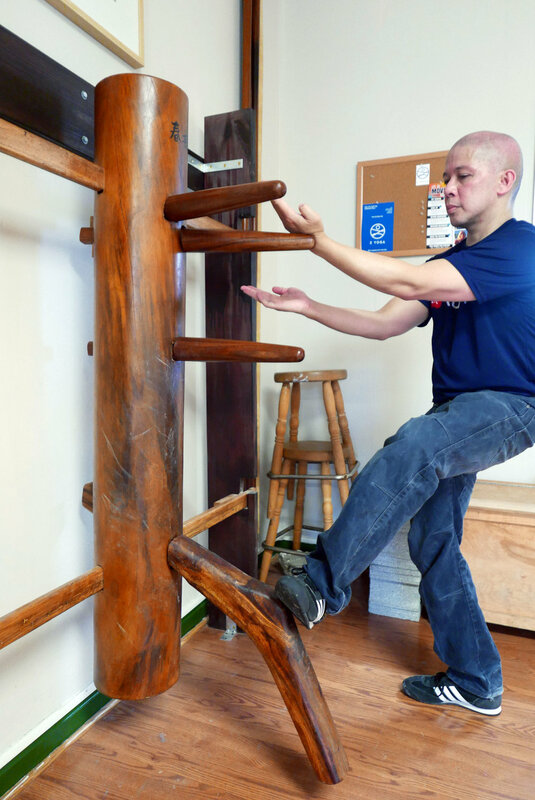 An icon of Ving Tsun (Wing Chun) Kung Fu, the Muk Yan Jong (wooden dummy) isn't used to teach Kung Fu, it's to perfect it. The Muk Yan Jong, otherwise known as the, “wooden dummy," is used to practice applied Ving Tsun. An eight-part form consisting of 108 Ving Tsun techniques is taught to expert level practitioners. The jong is not used to learn kung fu but to perfect it. When a Ving Tsun practitioner reaches a level of proficiency in the first three forms, Siu Nim Tau, Chum Kiu, and Biu Jee, they are opened up to the Muk Yan Jong. As the Muk Yan Jong is a, "wooden dummy," it does not take the place of training with other students. This stationary piece of training equipment has little movement. Thus, a Ving Tsun practitioner can practice techniques or a series of techniques but must conform to the Muk Yan Jong; allowing the practitioner to refine hand placement, distancing, stances, and other important elements. A student practicing the Muk Yan Jong form at Montgomery County Kung Fu. Moy Fah Jong, literally translated, means “Plum Flower Pillars.” It consists of a set of eleven wood posts which, when viewed from above, form the outline of the five petals of a plum flower blossum. The largest of the posts is referred to as a Muk Yan Jong, or “Wooden Man Trunk.” Its traditional place is at the center of the flower. A Muk Yan Jong consists of a a single trunk with three arms and one leg. It is also referred to as a Wooden Dummy, or Dummy, because of its passing resemblance to a man. Some dummies have additional sets of arms and a leg oriented in other directions on the trunk to allow more than a single person to practice simultaneously. The surrounding posts are called a Gerk Jong, or “Leg Pillars.” Each of the smaller ten posts are spaced from each other at a distance to allow a student to walk between them. These shorter posts can be reduced to only three pillars then representing the outline of a single petal of the plum flower blossum. Grandmaster Moy Yat playing the Muk Yan Jong form with light energy, emphasizing technique. Other styles of Kung Fu also have a Moy Fah Jong. However, their configuration and use are entirely different from the Moy Fah Jong seen within the Ving Tsun System. Because of this possible confusion, both the Muk Yan Jong and Gerk Jong portions of a Moy Fah Jong are usually referred to individually. Also, because of a lack of training space, most often a student will see a Muk Yan Jong removed from the center of the flower and mounted on a wall. Due to numerous fixtures which can act as a suitable substitute, a Gerk Jong is many times eliminated entirely from the training area. Although the two portions of a Moy Fah Jong are usually taught and practiced separately, both the Muk Yan Jong and the Gerk Jong devices serve the same purpose to a Ving Tsun student. The pillars are intended to refine a student’s movements. The feedback provided by striking, touching, and moving around the posts is, when used correctly, a reminder to a student as to correct positioning. Thus, a Moy Fah Jong can be looked at as a way to polish the techniques found within the Ving Tsun System in the absence of a suitable training partner. An excerpt of Grandmaster Moy Yat conducting a lecture on Gerk Jong. It should be noted that a Moy Fah Jong cannot, in itself, teach anything to a Ving Tsun practitioner. All of the techniques and attributes used when practicing on a Jong are learned elsewhere. It is because of this that Moy Fah Jong practice can be compared to a writer using a typewriter: If a writer does not know how to write or spell then using a typewriter, however proficiently, will produce only nicely formatted characters - a far cry from great prose. But, if a student has a strong and good depth of knowledge, learning to use their tool to its fullest becomes a way to streamline the actual mechanics involved so that it becomes second nature. The end result can, only then, become polished and begin to shine through. Text excerpted from an unpublished manuscript, by Moy Yat, circa 1984. Copyright© 1957–2007 Moy Yat Ving Tsun Kung Fu. All rights Reserved.